UNB's Dr. J. Herbert Smith Centre for Technology Management and Entrepreneurship (TME) welcomes award-winning business guru Rivers Corbett as the new Entrepreneur in Residence. The Fredericton-based UNB alumnus is the co-owner of Relish Gourmet Burgers and Trivnet Media Systems, owner of The Chef Group, author of 13 Fears of Entrepreneurs, and founder of The Entrepreneurs Summit. Dhirendra Shukla, UNB chair of technology management and entrepreneurship, says he contacted Rivers about being a guest speaker. Based on student feedback from his presentation and Rivers' interest in the centre, he was asked about filling the role. "His enthusiasm is clearly evident and contagious," said Dr. Shukla. "Rivers will greatly strengthen our ability to provide an effective, nurturing start-up ecosystem. He has been able to build businesses that many people would consider too risky. He knows how to differentiate a business in what could otherwise be considered a crowded marketplace. He has the passion and the can-do attitude that will help guide and motivate students interested in pursuing ventures of their own." Rivers has received numerous business honours including Profit magazine's Entrepreneur of the Year as well as being listed on Canada's Hottest Start-Ups list and Canada's Fastest Growing Companies list. In a short span of three years Rivers has seen his entrepreneurial venture take off, growing to soon-to-be 10 Relish locations across Atlantic Canada and the U.S.
As the Entrepreneur in Residence at UNB, Rivers will spend one day a week on campus mentoring students, acting as a sounding board for their projects and ideas, and he’ll be able to provide students access to supportive networks of people and organizations, which is so important for all successful start-ups. 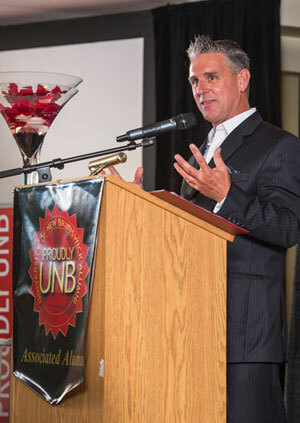 UNB has been, and continues to be, committed to encouraging the entrepreneurial mindset of its students. Dr. Shukla encourages students across the university to contact the TME centre to discuss their ideas and take things to the next level. Each semester an experiential course is offered where students have the opportunity to accelerate their start-up with hands-on guidance from industry and university mentors. "There are lots of great ideas around just waiting for someone with passion and drive to bring them to life. We have built an environment that fosters innovation and entrepreneurship for all to access." The only one of its kind in Atlantic Canada, the centre is named after Dr. J. Herbert Smith, a graduate of the University of New Brunswick's faculty of engineering who became president and chief executive officer of General Electric Canada. The centre offers a unique and innovative undergraduate diploma program that is designed to ensure students and working professionals with technological backgrounds have the necessary business and entrepreneurial skills to succeed in today's world. Several of the approximately 500 graduates of the diploma program have gone on to launch their own highly successful businesses such as Smart Skin Technologies, Scene Sharp Technologies and Inversa Systems.